Back from my hiatus. . .and the tropics are wild! I’m sorry for taking a break from this, but my current job requires lots of writing and the last thing I want to do at the end of the day is write a blog, but I’m going to change my approach. I would love to hear feedback from any of you on the following ideas. I am considering writing a weekly blog either Sunday or Monday that will describe the upcoming week of weather. I may also have a monthly outlook issued around the 29th of each month (if I remember). Finally, I will update on impending events, such as tropics, severe weather, or anything that will have a big impact. Again, feel free to give me some insight on what you want to see. Thank you! Now, on to the tropics. 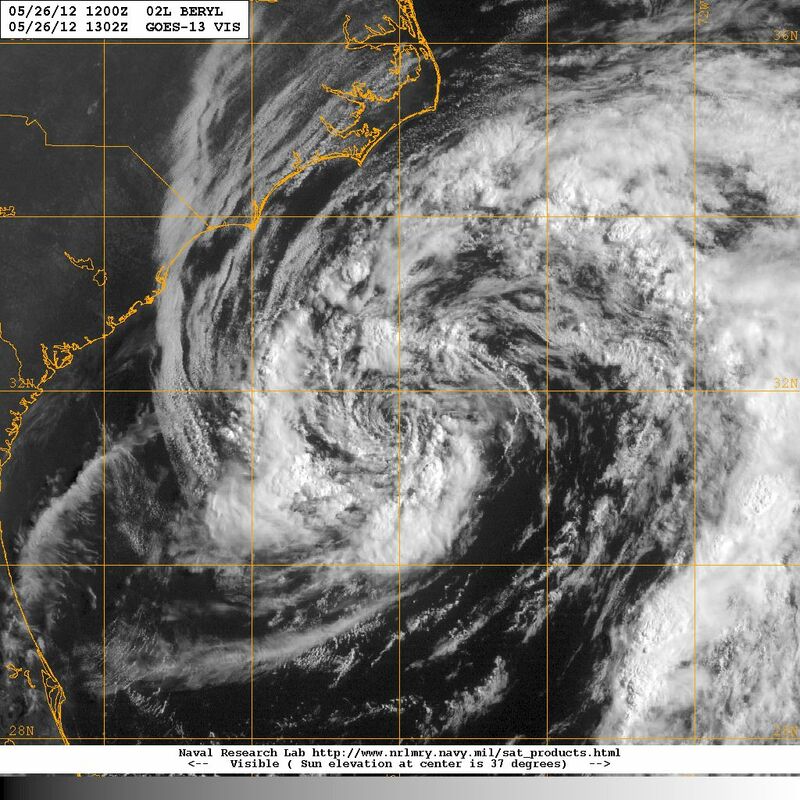 . .
GOES-13 (East) visible imagery of Subtropical Storm Beryl on 05/26. The above image shows the strung-out nature of our 2nd tropical (subtropical in this case) storm of the yet-to-begin 2012 Atlantic Hurricane Season. As you can see, the system is lacking much in the way of convection and is slowly moving to the southwest towards the GA/FL coastline. Most likely candidate for a landfall is somewhere between Jacksonville, FL and Brunswick, GA in the next two days. The current intensity as of 2 pm EDT is 45 mph and the forecast only calls for minor strengthening to about 55 mph by tomorrow evening with Beryl slowly acquiring a more tropical appearance. The GOES-Sounder red, green, blue (RGB) Airmass product that shows the dry air associated with an upper-level disturbance (low) associated with Beryl. The image above shows a new satellite product that I have been introducing at work which helps to distinguish different airmass types. In the lower, right corner is where Subtropical Storm Beryl is located off the southeast US coast. There is some orange coloring rotating in towards the system and this air is associated with the upper-level disturbance that is tangled up with Beryl. Until the upper-level system weakens, Beryl will have a tough time strengthening, even though it is over warm waters near the Gulf Stream. 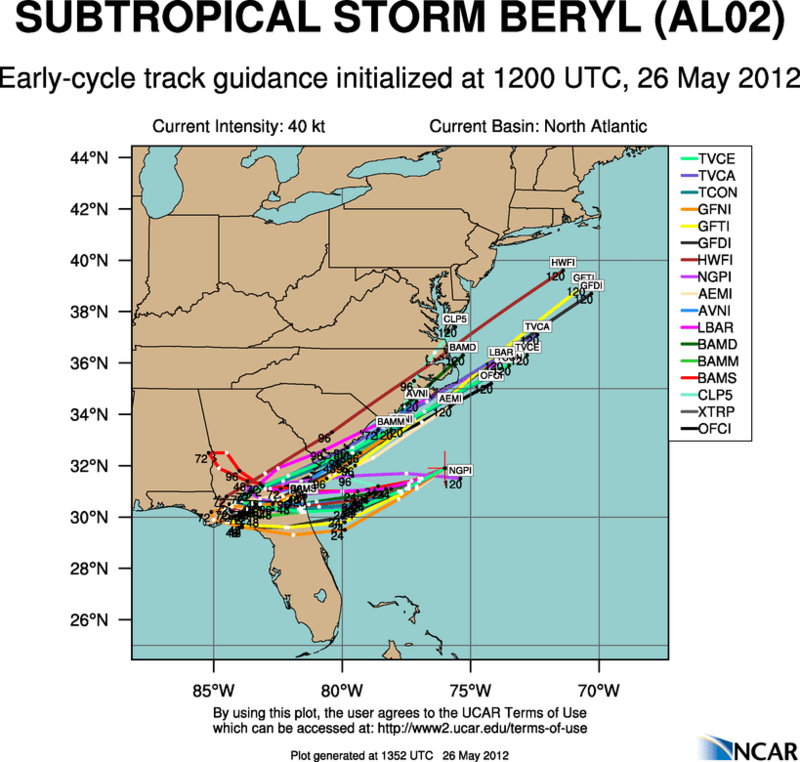 Various model forecast tracks for Beryl as of the 8 am model cycle. The forecast model tracks are in excellent agreement for a west-southwest motion over the next 48 hours followed by brief stalling somewhere near the central GA/FL border before quickly heading back over the water and off to the northeast. Some of the latest model guidance is showing a rather interesting scenario from eastern NC and VA, but I will talk about that later. Elsewhere in the tropics, we have Tropical Depression Bud in the East Pacific near the Mexico coast and Typhoon Sanvu that just passed Iwo Jima. I have included imagery of both storms below near their maximum intensity. 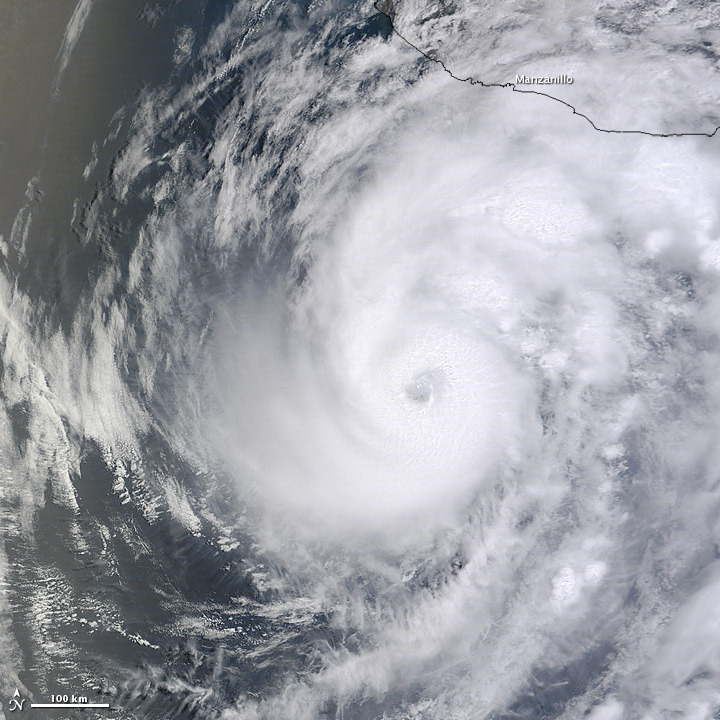 Hurricane Bud imagery courtesy of NASA’s Terra satellite during maximum intensity of 110 mph. 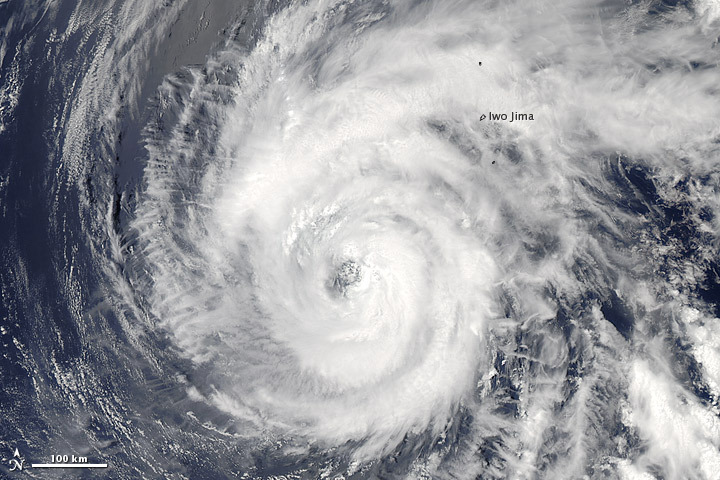 Typhoon Sanvu in the West Pacific courtesy of NASA’s Aqua satellite with an intensity of 90 mph. Previous Post A wild flip in the pattern on the way! Maybe you could do a 25-day forecast. Wouldn’t that fit in the “monthly” category? It’s just a joke about accuweather’s crazy product. Haha, you mean, that’s unrealistic??!! No way. . .